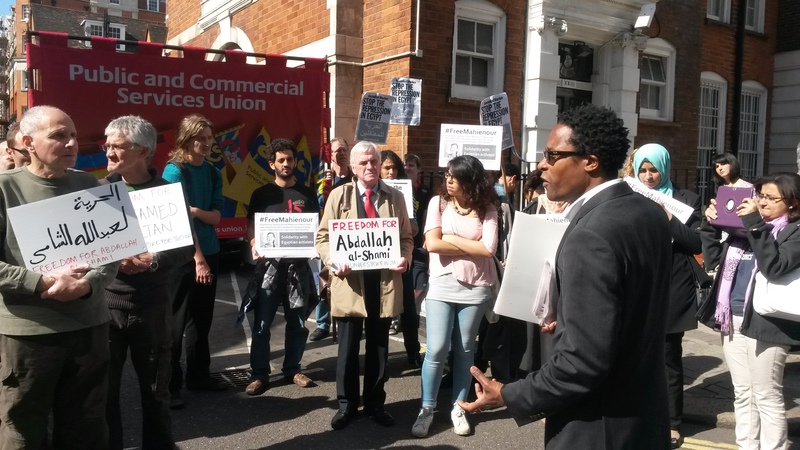 Demonstrators gathered at the Egyptian Embassy in London on 5 June to condemn the crackdown against opponents of the military regime. Days before the inauguration of Abdel-Fattah al-Sisi as Egypt’s new president, trade unionists, lawyers, students and activists handed in a statement condemning the mass death sentences handed down by al-Sisi’s hanging judges against regime opponents. More than 5,600 people from across the world have signed the statement. The protest also highlighted the increasing numbers of Egyptian activists who are being jailed under the anti-protest laws, including Alexandrian lawyer and revolutionary socialist activist Mahienour el-Masry. Activists carried placards calling for the release of journalist Abdallah al-Shamy, who was arrested while covering the massacre at the Raba’a al-Adawiyya sit-in last August, and Mohamed Sultan detained without trial after police came to arrest his father. Neither have been tried and Egyptian activists have launched an international campaign calling for their immediate release after months on hunger strike. 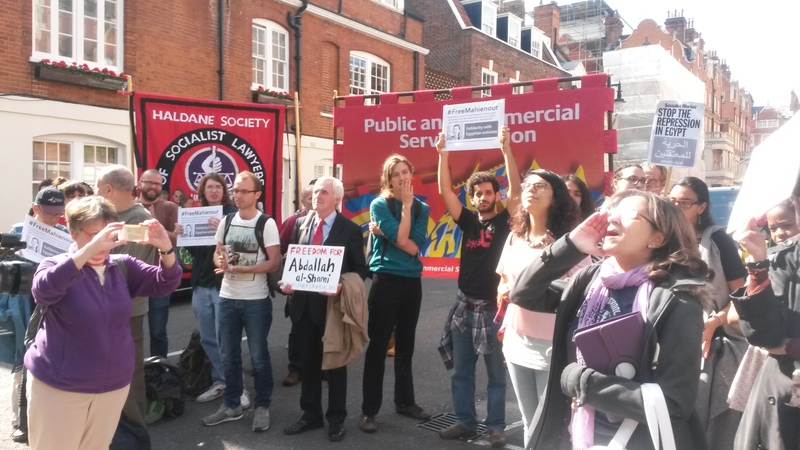 John McDonnell MP, Andy Reid from the civil servants’ union PCS and Brian Richardson from the Haldane Society of Socialist Lawyers addressed the demonstration.